I'm at the point in my yoga practice now where if I don't carve out time to spend on my mat for two days or more, I feel a difference in myself. I'm less settled, I'm stressed, my anxiety levels start to rise and I'm just a little less happy. When I do make time for yoga every day, I'm the version of myself that I am most proud of. I feel like I am living in every corner of my body and mind, and using that energy to carry me through life in a way that makes me feel more fulfilled than I ever have before. When I set out this winter to take it easy, come back to myself and really work on my foundations to make sure I was in a good place to start making things happen, I knew that yoga would be a big part of it. I've always done yoga a bit, here and there, never really committing but loving the idea of it. I never took the time to work on the foundations of my practice and my mind was too itchy to sit still long enough to hold a pose - it was too busy making lists. But when I decided to take a few months to invest in myself, I settled more into the idea of making a commitment to take at least 15 minutes a day to do some yoga. It wasn't easy at first though. My body ached and my mind wandered. I had a few false starts where I hurt myself a little bit and had to give up for a few days. But a part of me really knew what I would get out of it if I just stuck with it, and I craved that peace of mind so much that I just kept going. The truth of it is there's no quick way to get into it. There's no easy fix or techniques that will grantee that you will stick to anything. It starts with a decision and from there it's a journey. It's about finding what works for you, not getting discouraged by failures or your own weakness when it comes to 'not being bothered'. It's about forgiving yourself and coming home to yourself and just believing that you absolutely can, if you only give yourself a chance. Carve out a space - find a special corner in your home that feels great to do yoga in. Mine is the spot right between my bed and the radiator. Carve out a time - every day after walking the dog is yoga time for me. Without fail. Beware of a gap in routine - if I skip a few days, I'm more likely to skip a few weeks/months. I have to be mindful of that. 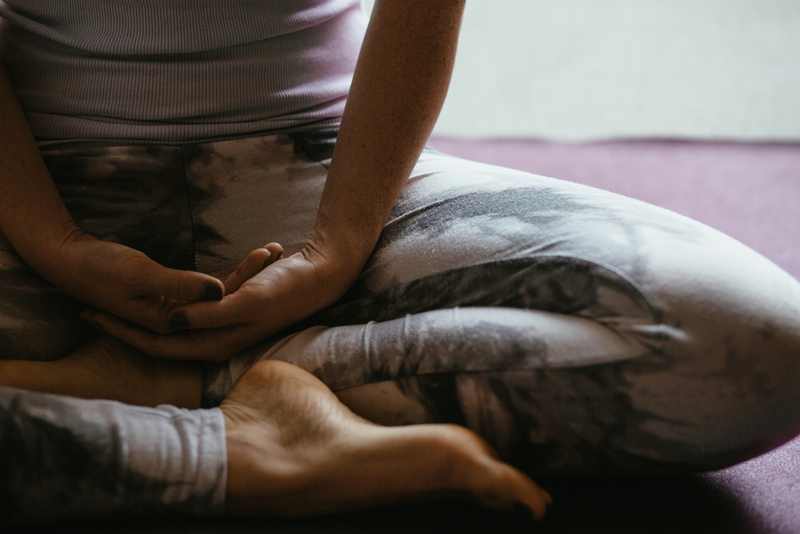 Start where you are, with what you have - I just started with a mat, and as tempting as it was to buy all those fancy yoga clothes, I use them now as treats for sticking with it instead of as an intensive to start. Make plans - my plans revolve around my yoga practice a lot now. 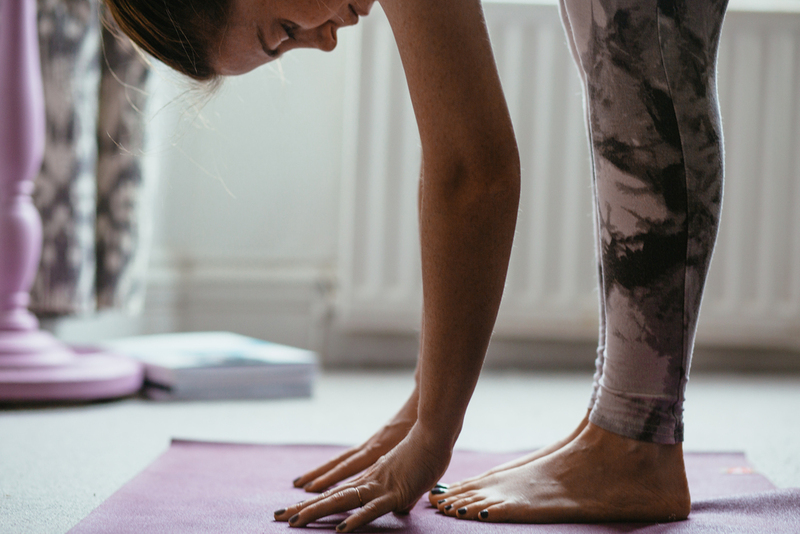 When I go out, when I come home, it all needs to fit in around getting the yoga time I need. Now that it has been six weeks and I have been doing yoga almost every day, even when I was in Senegal, I feel like it's not going anywhere. I'm not saying I won't fall off the yoga wagon, but I pushed through the tricky stage at the beginning and now I'm really enjoying it - I'm even a little bit in love with it in a weird way. I've graduated from the spot next to the radiator in my bedroom, to the middle of the living room floor as I've grown from a small practice to a more expansive one. And I keep my mat rolled out under the carpet in my living room, so that it's always there, ready and waiting. It feels like I’m starting a really good book, and in a few years’ time I’m going to look back and wish that I could start from the beginning again with fresh eyes because it was so wonderful reading it the first time. Nope, not today. Strategies for switching off. I am just awful at doing nothing. Duvet days make my skin crawl and the more I try to force myself into just switching off, the grumpier I get. But I do crave slow mornings and all day pyjama parties, or at least the idea of them. I love the thought of watching my favourite movies all day, eating pancakes for lunch and rotating cups of tea and hot chocolate as time slips away. But really, what ends up happening is this: I turn on the tv, open my laptop "just to quickly check something", hard drives are pulled out of my bag, notebooks become coasters for cold cups of tea and the tv is eventually muted because I can’t concentrate. But I'm all annoyed at myself for failing to switch off, so my work goes badly, ends up being useless, and the point of a day on the sofa is kind of lost. Peace. It does not mean to be in a place where there is no noise, trouble or hard work. It means to be in the mindst of those things and still be calm in your heart. We do live in a hectic world, but I find it is so important to create space in my life so that I have room to breathe. If I don't take a moment to look up from the path I'm running along, I have sometimes failed to notice that I'm going the wrong way. 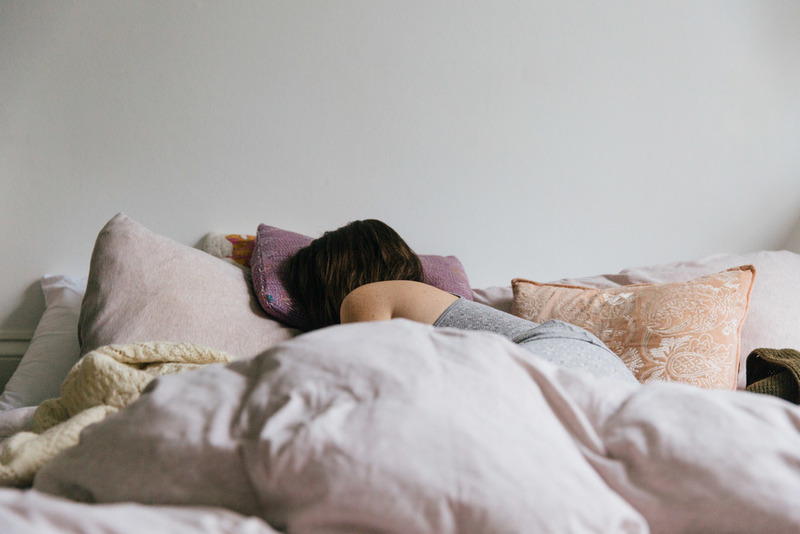 These are a few things I do to quiet my mind and give myself a chance to do nothing for a day – resting and recovering during The Quiet Winter is the most important thing. Take some time out to do a bit of stretching. My mind and body are always a lot calmer after yoga. Go out for a walk and get some head space, come back and get back into your pyjamas. Fresh air works miracles on the mind. Have a long chat with a friend on the phone. It’s not easy to let your mind wander back to work when you have to keep up the other half of a conversation. Take a long shower, I mean really long. My mind always calms down in water, maybe it’s the same for you? And then climbing back into my pyjamas after I’m all warmed up is the best feeling. And if you must busy yourself, invest time in something that makes you feel taken care of. Cooking your favourite meal maybe, planning a dream holiday, putting together an exercise plan. Doing something that makes you feel like you’re investing in your future is such a great feeling, and the next best thing if you can't invest yourself in the moment. Yawn sent me these pyjamas last weekend to try and I couldn't wait for them to arrive because pyjamas have been a favourite outfit choice of mine since I was little. I was excited because, new pyjamas, but also tentative because so often I'm a bit disappointed by uncomfortable/sweaty fabric or seems that stick into you at night. I have none of those complaints about this set - and of all the pyjamas I own, these are now the nicest and most comfortable of them all. Thanks Yawn! I swear January is the toughest month for so many because we don’t take into account how much we put ourselves through in the lead up to January 31st. And I’m not just talking about all the parties and drinking, I mean the feeling that you get at New Year like your crossing a finish line. I mean the lead up of the whole year. Like it or not the end of a calendar year feels like the end of an event, after which we’re more likely to feel tired than rejuvenated. Just this week I have been EXHAUSTED. I’ve been getting headaches, I can’t concentrate, I’m hungry all the time but slightly sick so eating is hard and all I want is comfort food – macaroni and cheese. I haven't even had the energy to take new photos for this blog post, so I hope that explains the sunset over Fez in case you were confused. I think a lot of people go through this in January and February, and then lose their momentum on the resolutions started with that amazing New Year feeling because they just don’t have any energy. And that’s not to mention the dark and the cold that many of us have to deal with. Personally I don’t think now is the time to blame yourself and get down about your inability to commit to the great things you want to make happen in your life, I think now more than ever is a time for self-care and encouragement. This time last year, when I was feeling crap and down about having no energy to get stuff done, I found a naturopath through Triyoga on a recommendation from a friend. I had no knowledge of naturopathy so I went in with curiosity and a bunch of gratitude for health insurance so that if it all turned out to be rubbish I wouldn’t be wasting any money. I just need to take a moment here to say that visiting Triyoga in Camden is a healing experience in itself. It’s the most beautiful yoga studio/café/place to hang out and if I could move in, I would. I met with Merran Lusher for about four sessions and it was interesting to see how she worked, using what my body was telling her to point me in the direction of supplements, vitamins and other things it was asking for. I still don’t really have a firm opinion on practices like Body Talk, etc… I don’t know if it works or not but the result made me feel a lot better so I’m glad I did it. After a few weeks of self-care, vitamins and following her advice on food and exercise, I felt a bit more of that New Year enthusiasm again and ready to tackle some resolutions. This week I’ve felt a similar sort of painful lethargy and instinctively went back to the advice I was given last year. The supplements, the food, and the self-care. I think it’s all too easy to blame ourselves when our grand plans get derailed by our lack of drive. But if things aren’t feeling right within, it’s probably because they’re not right. It’s not always easy to discover what the body needs, but it’s important to try, and once you figure it out and prioritise fulfilling those needs, amazing things can happen. If you’ve followed my online journey for a while now, you may know that my relationship with food is not a healthy one. I skip breakfast, drink too much coffee, I’m lazy with putting together meals so I prioritise carbs to quickly fill me up, I snack, and man do I eat way too much pizza – I mean, it’s a real problem. But the older I get, the less my body can cope with it. Not only am I not keeping the weight off like I used to, but the impact that junk food has on my mood is increasingly noticeable. I lack energy, I feel frantic half the time, I’m distracted and stressed and I can get really down on myself. I know what the solution is, eat healthier! But when it’s 8:30pm and the fridge is empty and my brain is a bit broken from a long day (of crap food), macaroni and cheese wins out every time. Or first thing in the morning when there’s nothing to do for breakfast except go to the coffee shop and buy something – that’s a big chunk of my weekly budget gone right there, and the coffee isn’t even that great! Teaching myself to be a healthier eater isn’t easy, it’s been a long road but the more I’ve travelled along it, the more inspired I’ve become. My repertoire of healthy recipes is still shockingly limited, considering I’m in no way a picky eater (just a lazy one), but I have a few firm favourites that are easy to make and keep me feeling good about myself because for me, the best part about healthy eating is making the choice to do something good for myself. And this Christmas Adam and I were lucky enough to receive a vitamix from Adam’s parents! Since we visited Hawaii last October I have been banging on about the vitamix and now that we finally have one, being healthy has never been so – effortless! This thing does everything! Soups, dressings, healthy ice-cream, dough, you name it, it’ll blend it. But what I’ve learned is that you don’t really need fancy kitchen gadgets to make a healthy start. All you need is to find a few main staples that you enjoy, that are easy to make and that you can mix up for variety so that you don’t get bored. For me, these staples are: the acai bowl and the bliss bowl. Both the acai bowl and the bliss bowl are a mix of the healthy things you find most delicious, they're easy and quick to make, and they're good for you. The acai bowl is mostly blended fruit with toppings like coconut, bee pollen, seeds, berries, more fruit, granola – really anything goes! You can even add in spinach and macha powder to make it a green bowl – but adding acai powder, or really any super food, makes it an extremely healthy and filling start to the day. Here's a recipe to get you started, and chocolate acai! The bliss bowl is a combination of vegetables cooked in a variety of different ways with different seasonings and sauces. At the weekend I roast a tonne of veggies, steam some kale, spinach, red cabbage – and each morning I assemble a selection of veggies on top of potatoes or brown rice to bring into work for lunch. It’s colourful and experimenting with different dressings is so much fun! Here's a recipe I found if you want to give it a try. If you’re lazy like me, then tahini and lemon juice is a firm favourite. But I’m also working on a miso dressing, or even something with nutritional yeast which tastes better than it sounds. Taking time this winter to instill some good eating habits, even if they’re the most basic, has been one of my favourite parts of The Quiet Winter. I’m getting more experimental, I made my own granola last night, and more importantly I have a sense of pride that only comes in investing in myself and taking care of my overall wellbeing. It’s been good for my body, my heart and my head. Yesterday I found out that my great aunt and I share the same bed time, except most nights I end up falling asleep about half an hour before she does - and she's 82. I have given myself the bed time of a child and I'm not in the least bit sorry about it because if there's one thing I absolutely can't do without, it's sleep. I'm not fit to be around if I haven't slept well, I can't get anything done and I instantly become more accident prone and a complete liability. Over these cold months I plan to spend A LOT of time in bed. If I could sleep for hours upon hours I would - but even if I'm not sleeping, bed is a pretty great place to spend time. Reading, having movie days, Skype calls with friends and family, knitting, or just daydreaming. But I'm sorry to say that I'm not the best at sleeping, or taking time out in general for that matter. I think most people fit into two camps when it comes to relaxing - some people love it and some people find it really difficult. I'm in the second camp. Even when I'm sick and stuck in bed I'm still convinced there are things that I could be ticking off my to-do list. It's a really bad habit. This winter I'm planning to make it a priority to get better at doing nothing. Far too many weekends have been taken off to relax, only to be spent doing chores. I'm getting really good at cleaning, tidying, organising and generally ticking things off. But while it's great to spend time getting your life in order, sometimes it's better to learn how to just do nothing. This post was written in collaboration with Leesa. A few months ago I realized that our old spring mattress was causing us to lose sleep and I began the search for a new one. Leesa mattress arrive squashed in a box and expand in minutes to a full sized foam mattress that has been made to order. We've been sleeping on our new king mattress for the past two weeks and I can honestly say that it has improved our sleep so much - no more back aches, no more waking each other up in the night, and no more pokey springs. If you like a good mix between soft and hard, the Leesa is a great choice. The ultimate purpose of deciding to jump into the quiet winter is to rest, recoperate and invest in yourself and your life - taking the time to make it everything you dreamed it would be. It's a beautiful thing, deciding to invest in yourself. It's an act of self love and self belief and it's proving to yourself that you think you are worth the investment. Just that decision alone can work wonders. But it's not easy. It means cutting back on a lot of what sustains your present life, reigning it all in to take a look at it and examine it in detail and make sure it's really working for you. And this is where the other half of the investment comes in, because the more you reign yourself in, the less money you spend. The more you save and the more you get ready to put into place your big plans, goals, dreams, whatever your heart is telling you it needs. Maybe that means you'll decide you want to save for a wedding, or for a house or for babies or whatever. A puppy? Maybe it means you want to save to travel the world, buy a big old truck, quit your office job and never look back. Both lives are equally worthwhile, if they're what your heart is telling you it wants. The thing with to-do lists is they always feel like chores. And I have life-admin to do for sure! Passport applications, paperwork, etc... But I think all of that belongs on a different to-do list and the trick with the boring stuff is to knock one item off each week until it's done. On my other to-do list are the things that make me feel like I'm combing the knots out of my life. One of those items is falling in love with the space I live in. I section off corners of my house, put Netflix on the laptop, or the Harry Potter audio books, or just some music, and get to sorting. I go through everything carefully and aim to get rid of as much as possible. I'm one of those people who feels better with less stuff, even though I am so sentimental and throwing things out is hard - it's also necessary. I've come to learn that a relationship with your home is something to be maintained, and you will feel as much love in your living space as you pour into it. Giving it love until it's positively glowing with pride - doesn't that sound like an amazing environment to rest in? Also, spending time in your home with your things, cleaning them up or throwing things out, is such a good way of getting to grips with where you are and how you got there. It's analysing the physical accumulation of your life and realising what was important and what is no longer necessary. I'm telling you, it's like therapy. And it makes your priorities seem a lot clearer. Also you can make it as time consuming as you want. Rush through it to move on to something that means more to you, or keep your own company while learning to enjoy it, and save your pennies for another day. Remember when I posted about how we afford to travel? And I mentioned something I called The Quiet Winter. Well this post is about what that means, and I think you’re really going to like the idea. Traditionally my travel year ends in October and starts again in the spring, and if you've followed me on my various platforms for a while you’ll know that I find the winter really hard. The lack of light, central heating, no fresh air, too much boring routine – it can all add up to something that has the potential to send me to a really dark place. Over the past few years it’s become harder and harder, and I realised that it was going to take a big effort on my part to shift my mind-set and turn it into a period of time I could really enjoy, one that I could really get something out of. So now I think of winter as my quiet time. Where I can rest, recover, plan and care for myself. Recuperate after some insane travel months, or a summer of just non-stop movement. During those months it’s easy to neglect your diet, exercise, overall health and wellbeing, and just get so caught up in doing that you forget to think about where you’re going. These days I think of winter as a restful time, time to take stock, check in with myself and build up some reserves. Mentally, physically and financially. I make less plans, I read more books, I do more yoga and I look ahead to the coming year and really try to think about where I want to end up at the end of it. From starting out as dreading winter and the cold, now I look forward to it as one long season where I can care for myself like it’s my job, and get ready for the active months ahead. And so here we are with a new series! In writing The Quiet Winter I’m going to go through everything that I’m doing to care for myself, mentally and physically. Everything I’m doing to make myself stronger and fitter for my travels and the questions I’m asking and answering to make sure that I’m on track for the year ahead – I mean as much as I can be, I’ve learned by now that planning only takes you so far. I'm going to share the way I make sure that I take time out to do nothing, how I stick to a yoga practice, where I spend money on things that are good for me and where I save on the not so good things so I can go traveling. I'll also talk about the books I'm reading, the podcasts I'm listening to. How I manage my social life and not being out every night without getting fomo (which is a very real affliction). And I'm also going to share how I check in with myself, make sure I'm doing ok, make any adjustments in my life and really make sure I'm doing what I want and not just want I think I should be doing. I hope this series will be helpful to you if you are interested in having a quiet winter too. If you're saving for something big, looking to spend some time checking in with yourself, or just flat broke and need to spend some time not spending any money (hey, we've all been there). And if you have any specific questions, let me know and maybe I'll turn the answer into a blog post.